The global tert-butanol market is consolidated in nature with ambitious plans for regions such as Latin America, Asia Pacific, and the Middle East and Africa. Manufacturers are concentrating mainly on these region owing to aggressive rise in personal care products, construction sector, automotive, and food and beverages industries. These have made the established or new players to turn their hands towards these developing countries. According to a recent report by Transparency Market Research, the global tert-butanol market, riding on various opportunity is anticipated to rise at a robust CAGR of 6.2% during the assessed period, 2016 – 2024. The global tert-butanol market which was worth at US$1.5 bn in 2015 is anticipated to ascend to US$2.6 bn by the end of the forecast period. It is well assumed that the market is likely to descend owing to stringent rules and regulations laid down by various governmental bodies pertaining VOC emissions. However, in spite of demotivating market players, it have aspired global players to focus on bio based solvents. This is anticipated to receive nod from the environmental concerned population as well from various bodies. This is likely to create various lucrative growth opportunity in the global market in years to come. Rapid urbanization along with rising industrialization in developing countries such as Japan, India and China is anticipated to help the market to expand. Economic development in various parts of the world have helped to ascend the disposable income, this have helped the market to rise further. Tert-butanol which finds its application in various industries such as pharmaceuticals, paints and coatings, and flavor and fragrances. Of these, paints and coatings industry held a whopping share of 35%, recently. Another factor that has helped the market to grow smoothly is aggressive rise in automotive industry all across the world. As mentioned before, rise in disposable income has helped the consumer to get their hands on vehicles, which had a direct influence on the growth of tert-butatnol market. Robust expansion of automotive industry is increasing the sales of paints and coating product, which is fostering the global tert-butanol market. Emerging countries are witnessing a strong growth of construction activities owing to rise in commercial buildings, renovation and other factors. Surge in construction activities have lifted paints and coatings market. Rise in demand for hospitals, amusement parks, schools, and other in developing region such as Middle East and Africa, Asia Pacific, and Latin America is anticipated to help market. Another important industry helping the market to grow is the pharmaceuticals industry. Steady growth of pharmaceutical industry is anticipated to bolster the demand of product. Growth in personal care product owing to change in lifestyle along with preference to live healthy life is anticipated to help the market to grow. Application of tert-butanol in flavors and fragrances is likely to create optimal opportunities for the market. On the basis of geography, the global tert-butanol market is split into Latin America, Asia Pacific, Middle East and Africa, ad Europe. Of these, Asia Pacific held the lion’s share in recent years. It held stupendous rate in terms of volume in the global market. Increasing sales of food and beverages along with rising application of paints and coating on construction and automobile industry is aiding the market to take the lead. Asia Pacific is also likely to become fastest growing market owing to substantial contribution from countries such as India, Japan and China. On the other hand the market in Europe and North America have reached their saturation and point and is likely to witness an average growth during the assessed period. This report analyzes and forecasts the market for tert-butanol at the global and regional level. The market has been forecast based on volume (kilo tons) and revenue (US$ Mn) from 2016 to 2024. The study includes drivers and restraints of the global tert-butanol market. It also covers the impact of these drivers and restraints on demand for tert-butanol during the forecast period. The report also highlights the opportunities in the tert-butanol market at the global and regional level. The report includes a detailed value chain analysis, which provides a comprehensive view of the global tert-butanol market. Porter’s Five Forces model for the tert-butanol market has also been included to help understand the competitive landscape in the market. The study encompasses market attractiveness analysis, wherein end-users are benchmarked based on their market size, growth rate, and general attractiveness. 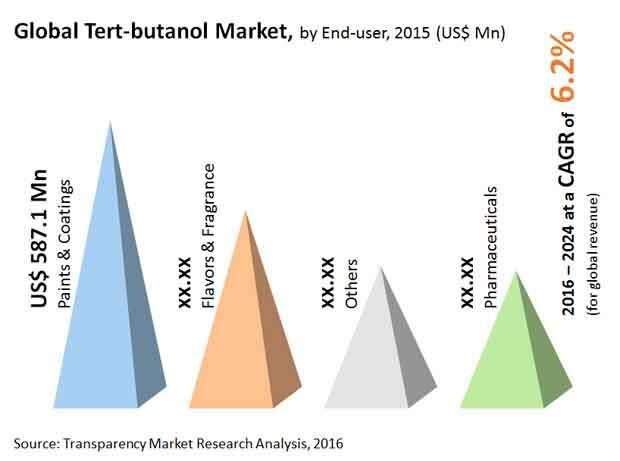 The study provides a decisive view of the global tert-butanol market by segmenting it in terms of end-users. These segments have been analyzed based on present and future trends. Regional segmentation includes the current and forecast demand for tert-butanol in North America, Europe, Asia Pacific, Latin America, and Middle East & Africa. The report also covers demand for individual end-user segments in all the regions. The study includes profiles of major companies operating in the global tert-butanol market. Key players profiled in the report include Merck KGaA, Evonik Industries AG, LyondellBasell Industries Holdings B.V., Tiande Chemical Holdings Limited, Tokyo Chemical Industry Co., Ltd., Kuraray Co., Ltd, and others. Market players are profiled in terms of attributes such as company overview, financial overview, business strategies, recent developments, and SWOT analysis. The report provides the estimated market size of tert-butanol for 2015 and forecast for the next nine years. The global market size of tert-butanol is provided in terms of both volume as well as revenue. Market numbers are estimated based on key end-user segments of tert-butanol. Market size and forecast for each major end-user is provided in terms of global and regional markets. Secondary research sources that are typically referred to include, but are not limited to company websites, annual reports, financial reports, broker reports, investor presentations, SEC filings, American Chemical Society (ACS), World Health Organization (WHO), American Pharmacists Association (APhA), Indian Resins Manufacturer’s Association (IRMA), ICIS, Hoover’s, Factiva, national government documents, statistical databases, trade journals, market reports, news articles, press releases, and webcasts specific to companies operating in the market.